One of the most misconfigured MySQL performance features, is MySQL query_cache_size. This post references a web server with 32 gigabytes of RAM where the existing config had MySQL’s query cache size set incorrectly to 4 gigabytes. The thought behind it seemed to be that more is better. Since the server had free RAM available, setting MySQL Query Cache Size very large would reduce cache prunes, thus increasing performance. THAT’S WRONG! This is an extremely common misconception and understandably so, because query cache sizing depends a lot on your database size, database query types, ratio of database reads vs writes, database traffic, hardware, etc. Set MySQL Query Cache Size no larger than 100 to 200MB! A MySQL query cache size of 200 megabytes may even be too large! The key is to start very small (maybe 10mb), then increase in small increments while trying to keep a high ratio of query cache hits and also a low amount of query cache low memory prunes. 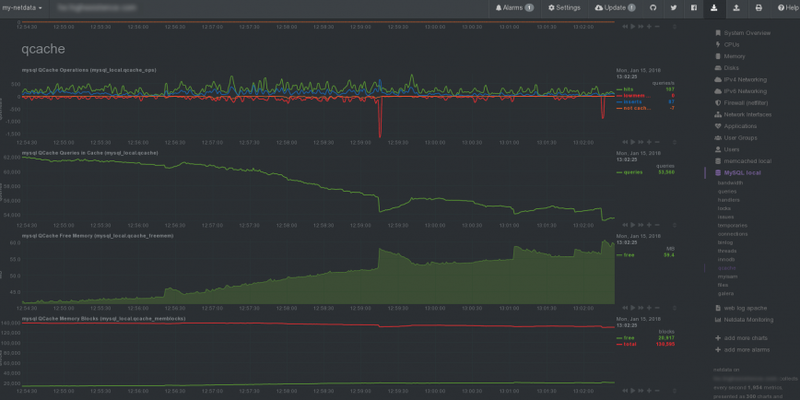 All of this without setting MySQL’s query cache size too large. Why? Because, a query_cache_size of 4 gigabytes is a good example of how query caching cripples performance when trying to scale. A large query cache size leads to significant performance degradation. This is because of cache overhead and locking. Cacheable queries take out an exclusive lock on MySQL’s query cache. In addition, any insert, update, delete, or other modifications to a table causes any relevant entries in the query cache to be flushed. This happens even when there’s free query cache space available. As a result, the larger the query cache, the more system time is used for locks, flushes and overhead until cache management eventually negates any benefit of MySQL’s query cache. Instead, it begins to eat away at database throughput. Even with a nicely tuned query cache, there’s still around 10% to 15% overhead required to maintain it. So your query cache hit rate percentage ((Qcache_hits / (Qcache_hits + Qcache_inserts + Qcache_not_cached))*100) should be as close to 100% as possible. That being the percentage of queries served by cache instead of being re-executed by the database repeatedly. Of course, anything below 10% or 20% means your query cache is probably doing more harm to performance than good. Usually I’ll keep query cache disabled if the hit rate is below 50% or… if prunes/purging rate is still high after increasing query cache size to a a safe limit. Also have a look at MariaDB’s (alternative MySQL drop-in replacement ) help page: MariaDB Memory Allocation – under the Query Cache section. Now, due to all the variations of MySQL setups, hardware specs and the fact that databases differ in demand, query types, etc etc, you will have to play around with your config and use this 200 megabytes max recommendation as a guideline to finding your query_cache_size sweet-spot. A MySQL query cache size of 200 megabytes may be fast on one server and begin to slow things down on another. As such, you’ll need to investigate, setup slow query logging and/or setup full query logging for a few minutes (depending on how busy your database is) and see how much time is spent in the query cache. Query caching can give significant performance improvements when used correctly and/or in conjunction with Memcached or Redis cache. As mentioned, the key is, when you start tuning your MySQL query cache size, start small. You should adjust your “query_cache_limit” because the default of 1 megabyte may be too large. 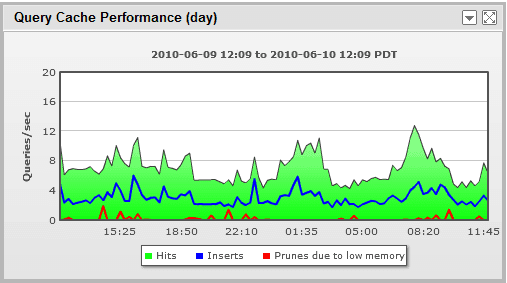 Allowing your cache to fill up too fast creates lots of cache prunes. Also, have a look at adjusting the “query_cache_min_res_unit” tuning parameter to combat cache fragmentation. Many times you won’t be able to store all cacheable queries in the query cache, but you can still make good use of it. Test, test, test! Not sure what to do with the stats returned? I recommend using mysqltuner.pl. This script will help you to avoid the most obvious MySQL performance pitfalls (including query cache sizing) and get you to where at least your database isn’t poorly configured. Also see: MariaDB (MySQL) Memory Allocation.